On Wednesday 4th July, eight incredibly skilled footballers from Years 3 and 4 travelled to The Wroxham School in Potters Bar for the inaugural district football tournament. We were placed in a very strong group and immediately had our work cut out against an experienced Wroxham side. Our defensive partnership of Gabriel and Oliver C were superb and refused to let anyone past them, whilst our midfielders covered every blade of grass. Just as time looked to have run out, Daniel popped up at the far post with a delightful shot to seal a 1-0 victory with the final kick of the game! Our second match was against St Giles, whom were steadfast in defence and, despite a number of good chances, proved impossible to score against. Freddie, meanwhile, excelled in goal and kept an impressive clean sheet as we played out a 0-0 draw. In the third game of the afternoon, we had a physically challenging test against a strong Oakmere side. Once again, the game was very even, with only a superbly struck free-kick from Leo being the difference between the two sides - another 1-0 win for Team BP! Our fourth game saw a wonderful performance from Louie, who scored what Miss Kropman strongly believes to be the goal of the tournament with a beautifully struck shot from the edge of the box, which resulted in the ball soaring into the top left corner - yet another 1-0 victory! In our final group game, we were pitted against Cuffley, who were another good side. More goalkeeping and defensive heroics kept our incredible clean sheet tally intact, but, unfortunately, we were frustrated at the other end and had to settle for a 0-0 draw. We were delighted to find that we had made the semi-final, in which we played Ladbrooke. With Jake back in goal, we held strong for the first half and were unlucky not to score ourselves. Ladbrooke sadly went a goal ahead late yet, fortunately, our efforts were rewarded with being awarded a penalty kick for a deliberate hand ball in the box. Up stepped Captain Fantastic Ollie J (AKA Harry Kane) with the calmest and most powerful spot-kick this reporter has even seen! It was 1-1 at full-time, which meant the game went to extra-time. With only three minutes to play, we knew it would be tough to score and, unfortunately, as we pressed forwards, Ladbrooke caught us on the break and scored themselves with only a few seconds remaining. Despite being gutted not to have made the finals, the boys should be incredibly proud of themselves for displaying excellent teamwork, sporting behaviour and talent to have come so far in the tournament. We were playing against some much larger schools and more than held our own throughout the afternoon, not conceding a goal until the semi-final! Miss Kropman was thrilled with the boys' effort and feels that the future of Brookmans Park school football is very bright! On Wednesday 6th June, eight talented players from Years 4, 5 and 6 travelled to The Wroxham School in Potters Bar to take part in a district football tournament. Pitted against a number of strong sides in the group stage, we knew we would have to work hard and play as a team - which we did! In the first game, we beat Cuffley B 2-0 thanks to goals from Tiana and Lily (with a fine finish - her first for the school as she normally plays in goal!). The second match resulted in a 3-0 victory against Wroxham's B team with a superb hat-trick from Tiana, whilst our third game was a hard-fought 0-0 draw against eventual tournament winners Little Heath, including an absolutely outstanding save from goalkeeper Melanie. The same result followed against Oakmere's A team, with midfielders Enya and Megan tracking back brilliantly to aid the solid defensive pairing of Thea and Rhianna. We therefore went into the final group game knowing that only a win would ensure possible qualification and, with every player demonstrating 100% effort, beat St Giles' B team 2-0 with both goals coming from Tiana. With both ourselves, Oakmere and Little Heath being level on points, goal difference dictated that we qualified for the semi-final as group runners-up, where we met Cuffley's A team. Despite battling incredibly hard, being led by a truly wonderful midfield performance from Evie, we just missed out on a place in the final after conceding our only goal of the afternoon through a moment of confusion at the back. Miss Kropman was very proud of the entire team and would like to thank them for their excellent behaviour and effort on a very hot afternoon! Our first Rounders Club team took part in a fixtures event at Sir Frederic Osborn School in May. We played 2 matches, one against St Micheals Woolmer Green and one against Watchlytes School. The First Match was a close one with rules our team had not followed before but they worked really hard and fielded well. It was a close game with the BP team winning by just 1 rounders. The second match was really enjoyable and everyone on our team managed to score at least 1 rounders and at least 1 half rounders each. That one was a more comfortable win with a 9-4 victory. The Netball Club took part in the end of season Netball Competition last week. This is part of the Potters Bar Schools League and organised by ther BP Rotary Club. Both teams put in plenty of effort and played brilliantly throughout the evening. The A team made a great start winning their first 4 matches. They went on to draw 2 and then lose 2, against Cuffley (league winners) and Little Heath (eventual competition winners). The girls played really well as a team demonstrating excellent team work and effort. They came in 4th place overall. The B Team had a very successful campaign, winning all their matches with the exception of 1 draw. The worked hard and played really well as a team. They had a thoroughly enjoyable afternoon. Lily Caitlin was awarded 'Player of the Competition' by the umpires after displaying excellent play. The B Team won their part of the competition! Two teams of Year 6 children took part in a Quick Sticks Hockey Competition at Monks Walk School. All the children played really well with some excellent sporting behaviour. It was a good opportunity for some to put their skills into practice and others to try a new game. The was a great display of teamwork and encouragement between the children. Both teams played 3 games each with a mixture of wins, draws and loses. They finished in 5th and 7th place out of 8. Well done Megan, Thea, Ollie, Louis Joe, Luke, Georgina, Aleyna, Archie, Elliot and Oscar! Our Year 6 Netball A team took part in a Welwyn Hatfield U11 Netball Competition at Stanborough this week. The girls played well in the group stages and got some good results. They lost their first match and then went on to win enough to move into the finals stage. They showed excellent teamwork and communication and did a fantastic job coming 2nd out of 8 teams. Well done Thea, Alicia, Maya, Scarlett, Olivia, Issy Eva and Tiana. 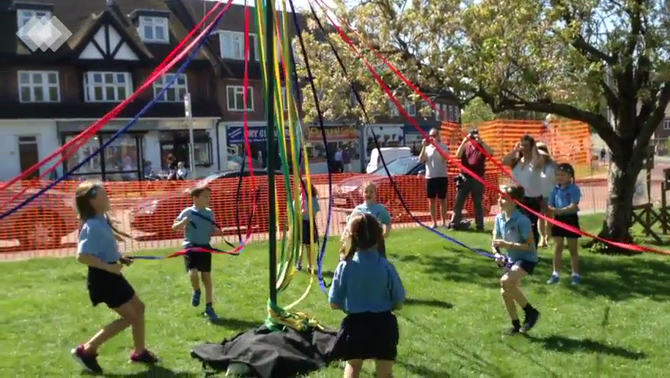 On Saturday 5th May, ten Year 3 children proudly took to the village green to perform a maypole dance as part of the Brookmans Park May Day Rotary Club celebration. They had been working exceptionally hard with Mrs Davies over the past few weeks to learn their dance which, as you can see, they performed brilliantly! On Friday 23rd March, Brookmans Park played Ladbrooke at home.The match once again began very evenly, with both sides coming close to scoring in the opening five minutes. Just before the half-time break, however, Year 4 superstar (and A team debutant) Enya closed down the Ladbrooke defence and fired a fierce strike into the bottom corner of the goal to give us the lead! In the second half, our defensive pairing of Lily and Evie kept the Ladbrooke attackers at bay, whilst Megan proved impressive in her first stint in goal. Further up the field, midfielders Thea, Aleyna and Holly covered every blade of grass, working tirelessly to feed our strikers. As a result, Tiana managed to score a magnificent second-half hat-trick as we took all three points with a fine 4-0 victory. Congratulations to Thea, who was crowned Player of the Match both by the opposition and Miss Kropman. Well done, girls! On Friday 16th March, Brookmans Park played Wroxham at home. After a very even start, we went into half time at 1-1 thanks to a fine finish from Tiana. In the second half, however, we really began to dominate the match. A spectacular strike from the half-way line by Rhianna saw us take the lead, whilst there were a further two well-taken goals from Tiana. Megan L also found herself on the score-sheet after a super run into the box and determined finish. This was followed by an own goal which wrapped up the points as the game ended in a 6-2 victory. Congratulations to all of the girls for an excellent performance and to our players of the match: Tiana (as chosen by Wroxham) and Rhianna (as selected by Miss Kropman). On Tuesday 6th March, our A and B teams played matches against Cuffley School. First up was the A game, where our girls battled brilliantly against very strong opposition. Sadly, we lost the game 3-2, despite a brave and determined performance and well-taken goals from Thea and Tiana. Well done to Rhianna, who was crowned player of the game by the opposition. In the B team match, we dominated from the outset and produced an excellent team effort to win the game 2-1. Our two Year 4 players particularly shone, with Enya scoring both of the goals and Melanie being named player of the match. Well done to everyone who took part - Miss Kropman is very excited for your next games! Year 6 took part in the Monks Walk Indoor Athletics Competitions at Gosling Sports Centre. They tried a variety of events including Sprint relays, long distance, javelin, Standing triple and long jumps and speed bounce. Both the boys and girls teams had a fantastic afternoon and some great results. The girl’s finished 4th and the boy’s 2nd out of 7. The boys have qualified for the next stage of the competition which will take place in March. Well done to the children from Key Stage 1 and 2 who took part in the Gosling Key Steps Gym Competition on 28th February. You performed your practiced routines with confidence and smiles. Keys Stage 1 performed a group routine to music and kept in time well and didn’t forget a step. They came in 2nd place overall. Key Stage 2 performed independent routines and vaulted really well and finished in 3rd place overall. Well done Isobel, Zac, Isabella, Liliana, Andreas, Leila, Gabriella, Georgia, Ilana, Amy and Teagan. 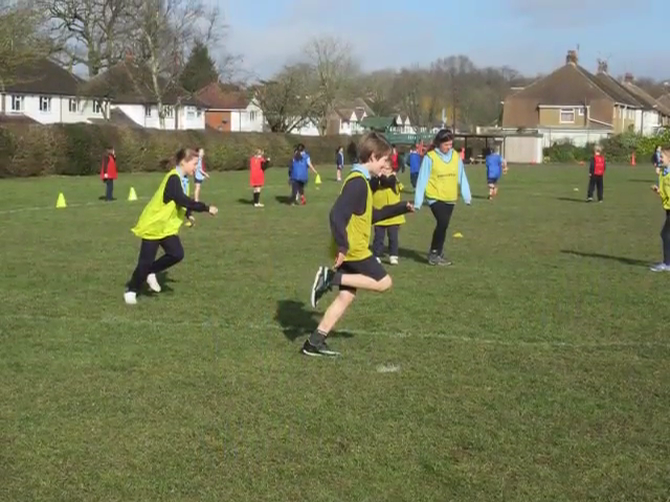 Children from Years 5 and 6 took part in the Mid Herts Cross Country Competition at Queenswood School. All our competitors worked hard, running their best on a 1.5km course. The course was a combination of grass and woods and there were flat and hilly elements. With 70 competitors in each race we had some excellent results both individually and overall. In the boy's race Luke finished 2nd place with Ryan, Harry, Harry and Filip all finishing in the top 20. The boys team finished SECOND overall. In the girl's race Thea finished 5th, Grace, Tiana and Kiera all finished in the top 30 and Evie and Annabel ran a fantastic race. Well done team Brookmans Park! Well done to Che, Jayden and Oscar who participated in the Boccia Festival at Goslings Sports Centre. The team played well and really enjoyed themselves. They played 6 games and won 5 of them! Last week 8 children from Year 6 took part in a Table Tennis competition at Sir Frederic Osborn School. The teams, made up of 4 girls and 4 boys played really well and learned some new ways of serving and passing the ball. Each player played at least 4 individual matches and everyone involved won at least 1 match. The children represented the school fantastically and played fairly throughout. Well done! Well done to all the year 6 children who took part in the friendly Tag Rugby Festival at Saracens Welwyn Garden City last week. We won all our matches and impressed Mrs Davies with a fantastic display of teamwork and sporting attitudes all round. Well done! Following the success of our Year 5 Running Festival 4 children were selected to run for the Monks Walk Partnership at the Borough Partnership Finals. The children ran 1.7 miles and all put in an astonishing effort. Annabel and Keira represented the school and the partnership fantastically as did Harry and Luke. All 4 children contributed to a win for Monks Walk Partnership and Luke was the overall winner in the boys race. Year 4 and 6 were lucky enough to take part in a Goal Ball workshop at the start of the Autumn term. Great fun was had by all the children and it was an invaluable learning experience for all the children involved. Goal ball encouraged the children to communicate with each other and work on their teamwork skills while experiencing a Paralympic sport. pre-season festival at Mount Grace School. Both our A and B teams played with great effort and demonstrated some impressive teamwork. An encouraging start to the season. On Friday 6th October, a team of eight plucky Year 6 girls attended the Welwyn and Hatfield Sports Partnership Year 5&6 football tournament, which was held at Monk's Walk School. We were placed in a preliminary pool group to determine the strongest teams present and, after claiming victory in all of our games, were pitted against Birchwood and Welwyn St Mary's in the 'gold' pool. After some resolute defending from Thea, Aleyna, and Anastasia, we kept our clean sheet record going into the final game, with 'keeper Lily excelling between the sticks as we beat Birchwood 1-0. Our last game was against a very strong Welwyn St Mary's team yet, once again, our goal-machine Tiana was in fine form, ably supported by a talented midfield trio of Holly, Megan and Rhiannon, and we retained our undefeated record! Crowned champions of the tournament, the girls should be very proud of themselves! Well done year 6 girls for your fantastic effort at our first High 5 festival of the year. A really impressive start and a great show of skills, tactics and netball enthusiasm!